This was a personal mantra for Declan Sullivan, a mantra that even after his death in October 2010, resonates strongly among his family and friends in his stead. Since his passing, his family has established the Declan Drumm Sullivan Memorial Fund in his honor: a fund that supports non-profits in our city of Chicago, especially those focused on community service and education. In particular, the scholarship mentoring community Horizons for Youth. The organization is dedicated to helping low-income students from Chicago through scholarships, one-on-one mentoring, and more. Aligning with Declan’s mantra, the DDS Fund has thrown No Ordinary Evening for the past five years to celebrate Declan’s life. Last month, VarCity Apparel spoke with Declan’s father, Barry Sullivan, who is the Head of Development at Horizons For Youth, about this year’s event. Part of the celebration – held in Navy Pier’s Grand Ballroom – includes the introduction of “Declan’s 75″: seventy-five students added to the Horizons For Youth program as a result of funds wholly contributed by the DDS Fund. What started as 40 students in the fundraiser’s second year has since expanded to 75! 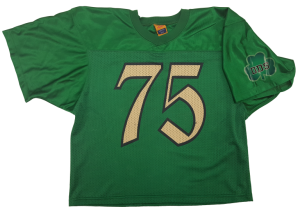 VarCity Apparel was proud to work with Barry and Haley Verbeke at Horizons For Youth to design football jerseys – in the spirit of Declan’s favorite Notre Dame – for the students to wear. This year’s theme was “Off the Record,” a tribute to Declan’s love of music and movies alike. VarCity Apparel caught up with both Barry and Haley after the event – which was expected to host over 750 people – to see how it went! “Many guests have said this was the best year for the event,” Verbeke said, going onto add that the event had exceeded expectations by raising over $720,000. Verbeke mentioned that the guests’ favorite part of the evening was the unveiling of Declan’s 75. “The kids and their mentors received a standing ovation. 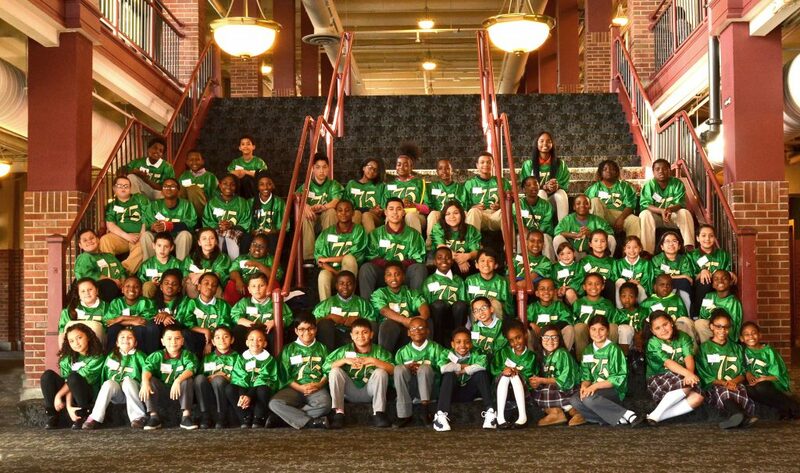 All of the kids loved their new jerseys and the guests were extremely moved.” The evening was emotional for many. This year, a video interview featuring two graduating seniors was shown to the audiences. Both students are Chick Evans Scholars and ended up showing up on stage after the conclusion of the event. “A very emotional moment,” Sullivan said. The goal for next year is naturally to keep expanding to a larger-scale audience, ultimately. Celebrating Declan’s memory and honoring it by allowing for more opportunities for others to be extraordinary, just like he was. VarCity is always ready to create your favorite custom jerseys in Chicago, IL and over the US, that makes your moment a memorable one.